Can I use people toothpaste on my dog? Human toothpaste can cause illness or deadly if swallowed in quantity especially for pets. I never knew this until one of my instructors told me to read the label. People have the ability to spit out while brushing teeth. 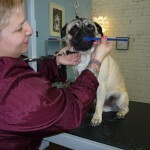 Dogs cannot and the reason for dog enzyme toothpaste that doesn’t have to be rinsed out. I always thought that kibble was better than wet food for teeth. After 15 years of my cats eating kibble, I have found that hereditary plays more of a factor. I had two cats that I rescued in 1998 only a few years apart from different litters. They have always been on kibble. One always had bad teeth with yearly cleanings while the other was fine. When I asked the vet, they confirmed hereditary is a factor. A vet once told me, imagine eating crackers or kibble all your life and never brushing your teeth or flossing. How much caked up food will be on your teeth? This made total sense. Once I got Beetle, I started teeth brushing. In order to have any impact you should brush 3 times a week. You are probably thinking, oh my! Sometimes I’m good and then I forget, I’m human. For us its easier to do it before we all go to bed. Bad teeth can cause kidney failure as well as other health problems. Beetle is an avid chewer with his Nylabones and Deer Antlerz for hours, you would think his teeth are plaque free but we are not so lucky. 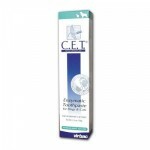 I really like the vet toothpaste, C.E.T enzymatic vanilla mint. Its definitely is a bad breath killer. I used to buy beef or poultry flavored toothpaste and realized that dog breath already smells like this. A friend of mine who also is a groomer informed me about the effectiveness of it and I love it. In Oakland, its available off the shelf at PetVet for under $7 on Broadway/Pleasant Valley or at your local vet. 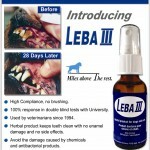 Another product that has some praise is a spray found in ModernDog magazine called LebaIII. With its $60 price tag, I haven’t tried it out but have seen a few before and after pictures. I really like the results without having to put my dog through anesthesia granted I have to follow their instructions. There are a variety of things like dental chews, water additives, and oral rinses. Any one of these is a step in the right direction especially with teeth brushing added into the mix. I know this is easier said than done for a lot of us. This entry was posted in Health Tips, Pet Care by Vanessa. Bookmark the permalink.